Official MarineParents.com Facebook Groups Volunteer Positions. If you are interested in applying for a Facebook Groups Volunteer Position, we request that you apply online marineparents.com/contact/application.asp. When you submit your application online, please include name(s) of volunteers who suggested you apply for a position in the "references" field. Incomplete applications will not be accepted. All MarineParents.com Facebook Volunteers (MP FB VOs) start out as a Volunteer in Training (VIT) and must complete independent, online training by reading the training sections of the MP FB VO website (MarineParents Facebook Volunteer) and asking questions of their trainer in the MP FB VO training group. The trainer is typically the assistant coach or coach of the MP Team Group in which the VIT will be working. Initial training for MP FB VOs is followed up with a period of mentoring in the MP Team group; the mentor is assigned by the trainer. After mentoring has been completed, the decision for the VIT to moved into a Group Guide (GG) position will determined in a discussion with the VIT, trainer and Group Leader (GL). The period of training and mentoring will take from 6-8 weeks. Volunteers agree to give two weeks notice when leaving a volunteer position whether for a lateral move, promotion, taking on additional responsibilities, or resigning completely from tenure as a volunteer. Volunteer must be a family member of a Marine who has graduated from boot camp and may be in any stage of the Marine Corps post-boot camp including schooling (SOI or MOS), Fleet, PDS, Reserves, Veteran, or After the Corps. The services, mission, and outreach programs of the organization. willingness to gain an accurate understanding of the organization's strict application of OPSEC and PERSEC in Official MP FB groups. We encourage parents and guardians to step back and allow the adult recruit or Marine to perform their training and subsequent job duties without parental interference. an understanding of new and existing corporate policies, procedures, protocol, and philosophies. We have 11 Teams of Volunteers and each team has a Coach and Assistant Coach. Coaches are responsible for assuring the team as a whole is organized, commitments and dates are met, and information is disseminated to all team members. The Team Coach also works with the VO Hiring Coordinator and Content Coordinator to assure website content and posts are up-to-date for the team's needs. The Assistant Coach works directly with individual team members during training and mentoring and assists with day-to-day operations. 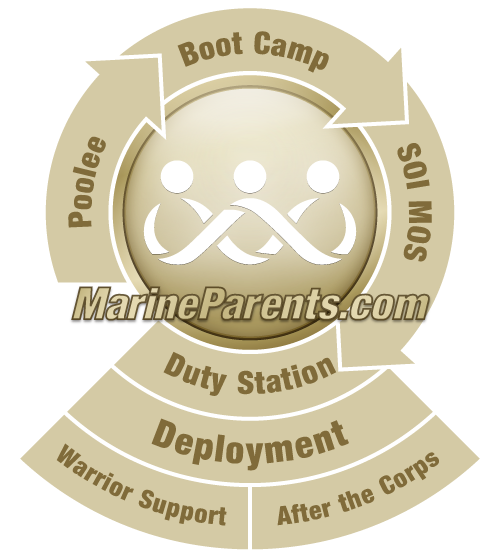 We have one Group Leader for each of our official Marine Parents Facebook groups at any one time. The Group Leader is responsible for overseeing the volunteers day-to-day operations, reviewing group posts, and leading the volunteers assigned to their group. The Group Leader reports to the Team Coach. Each group leader follows procedure and protocol for disseminating information to the members of their group. We have multiple Group Guides for each group. The Group Guides are responsible for assuring adequate coverage of the group for sharing of information, answering questions, directing members to the Official Marine Parents website pages for information, and promoting products from the EGA Shop. Group Guides are also mentors for Volunteers in Training to become Group Guides. The Group Guides report to the Group Leader. Each Group Guide follows procedure and protocol under the leadership of the Group Leader. All volunteers for the organizations Facebook groups start at the Volunteer in Training level. We have multiple Volunteers in Training in every group. Volunteers in Training must have a Marine in any stage of their career in the Corps or afterward. The Volunteer in Training is responsible for posting welcomes and encouraging messages to the members of the group as well as promoting products from the EGA Shop. The Volunteer in Training reports to the Group Leader. Each Volunteer in Training follows procedure and protocol under the leadership of the Group Leader. We have two volunteer coordinator positions who work directly with Team Coaches to coordinate work between volunteers and the corporate office for Content and Volunteer Hiring. Responsibilities include collecting information and requests from coaches to leaders to disseminate to the corporate office for appropriate action.